Segas in the company of ardent Sega fans only. were and counting their losses. finest examples of the genre..
(hereafter known as 'Souky') and Treasure's quite brilliant Radiant Silvergun that makes me really wonder about the unrealised potential of the Saturn in the West.. As far as tradititional shooters were concerned the only western releases that we actually got were through Acclaim's Taito distribution of three of their titles: Darius 2, Darius Gaiden and Layer Section (under the guise of Galactic Attack). Well at least Acclaim did something right in this particular instance eh? Oh, I forgot about In the Hunt (Irem) and Parodius.. Anyway, while we did manage to get a handful of Japanese A-grade titles over here which also included the Panzer Dragoon series, Treasure's Guardian Heroes and the Working Designs translated Dragon Force etc, Sega's rather dubious western release strategy basically left us swimming in bland soup of mediocre fare (Bug, Crypt Killer, Titan Wars anyone?) while the Japanese were experiencing the joys of the many highly creative and superior titles which were never to see the light of day outside the western shores of the Pacific Rim.. Damn shame really.. Working Designs, which, as most of you will undoubtedly know are famous for bringing some excellent RPG and shooter titles to the West, including the PSX versions of Raystorm and Thunderforce V, were one of the casualties. 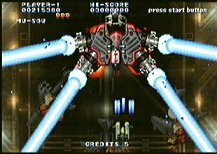 Around the time of those releases, WD had a deal in the pipeline to bring across a number of excellent Saturn shoot em up titles, including Thunderforce 5, and Souky itself. "The Saturn version was licensed and ready to be announced (along with 6 other Saturn shooters - Thunderforce 5 ,Thunderforce Gold Pack 1&2 ,Hyper Duel , Blast Wind and Sengoku Blade) when it became obvious that Mr. (Bernie) Stolar and Co. were out to trash the Saturn...fast. 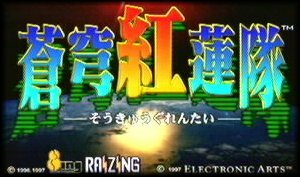 We canned all deals, and Soukyugurentai was one of them.."
Souky is a brilliantly conceived horizontal-format* vertical shooter by a new (to me) company, Raizing - who also produced Battle Garegga and Kingdom Grandprix. Originating from an S-TV (Saturn hardware) arcade title, this is a game in the typical Japanese shooter style that more than satisfies greatly in all departments: addictive quality, design, styling and presentation, and of course.. gameplay. * Vertical scrolling but designed to use the width of the TV screen rather than requiring you to plonk your telly on it's side..
FAQ later on this page for English translations) but it looks to me like standard fare  Aliens vs the Earth etc.. However, although weve all been down this road countless times previously, Souky does it all with so much vibrant stylishness and panache that you cant help falling for it. After witnessing the spot-on presentation and an excellent real-time intro sequence, the thing that strikes you when you first play through it are the stupendous graphics, which feature highly effective 3D polygon/2D mixed backgrounds and a great deal of neat FX such as sprite scaling, zooming and rotation, to a degree the likes of which I dont think Ive seen quite the like on any other home platform. It really is quite an eye-opener the first time you see the zoom-in on the enemy Tank Boss of stage 3 or the huge Mech Boss rush into the screen from a tiny dot to a full-screen monster on stage 4  all silkly smoothly and in hi-res too! 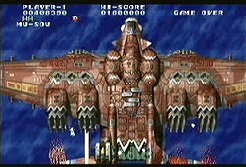 A lot of the sub-bosses are also hi-res, and the detail in much of the graphics is simply exquisite (see your home Mothership on the launch sequence at the start of stages 2 & 3 and those 'Flying Wings' later in the game for example.) It's really rather incredible how much effort has gone into just the graphic design here. I usually dont care too much for shooters which dont have a telly-on-side vertical mode, but Soukys design is so good, making use of the extra screen-width with plenty of side attacks and fair warning of attack from ahead or below - this is not to say its not a damn hectic game, especially on the higher levels, which almost leave you panting for breath due to the constant, unerring hostile fire from all angles. ( If, however you are one of those too scared to turn your TV on its side youll find this game a godsend as you don't have to..) .Although Souky takes a lot of inspiration from Taitos Ray-series titles (Rayforce & Raystorm), particularly in the web-weapon  a derivative of the lock-on system first implemented in Taitos games it also adds a lot of extra design details of its own. Each ship has its own specific weapon features as can be seen the section relavant section on this page- and each has a slightly different feel and its own particular advantages/disadvantages with none being particularly better than any other, which of course is the way it should be. I do however have a particular fondness for the green ship myself (the only one in which I have managed to complete the game so far). 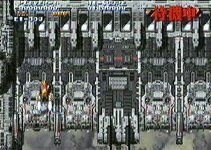 Overall: Souky is an absolutely top-class title which would certainly have boosted the Saturns image had it ever been released over here, but it was not to be.. Try and pick it up through an importer though, as along with Radiant Silvergun this is technically the finest shooter on the system, as well as a stunning, inventive and compellingly playable (and replayable) game in its own right. Well worth owning indeed. Games like Metal Gear Solid garner all the attention these days. It's a brilliantly presented production with atmospheric sound design, film noir-like visuals, and a twisting storyline. But its marred by the fact that once completed, it doesn't have many redeeming features. The option of being invisible after having finished the game is an extraneous extra and nothing to get the heart racing. Most of all the game is not even all that challenging. And thats my main point here - new games don't offer any of the fast, tense, sweat-inducingly tough gameplay of the older titles. Shoot 'em ups, or to be precise the two-dimensional shoot 'em up is an example of the latter and to today's videogaming audience, are virtually unheard of. Given the power of the consoles of today such as the Saturn, PlayStation, and Dreamcast, it's quite annoying to know that many developers are too scared to exploit the genre's potential just because of how unpopular it is. If you look at if from their perspective though you can see why - stuff like Raiden is simply not as marketable as the latest Tekken installment or a new edition of Quake. The chances were and still are slim of seeing shoot 'em ups on the newest consoles. 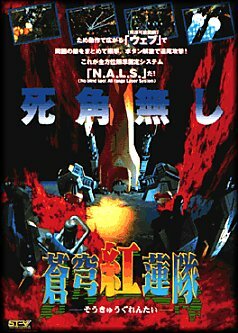 Hell must have froze over then, when genre-tributes Einhander, R-Type Delta, Soukyugurentai and Radiant SilverGun were released considerably late in the life-cycles of the PlayStation and Saturn. With the exception of Radiant SilverGun, I have played all the mentioned titles and I'm of the opinion that they are all top class games. The least most commercially viable game - at least in the West - in this foursome is Soukyugurentai : it's one of the toughest and most of all it's of the notorious 'vertical-scrolling' breed which is perhaps even more frightning to the casual gamer than horizontal-scrollers due to their hectic and frenetic nature. At a time when the industry offers banal GoldenEye, Resident Evil and Collin McRae clones, Soukyugurentai (along with Einhander, R-Type Delta and Radiant SilverGun) comes as a breath of fresh air. Developed by an obscure Japanese company by the name of Eighting/Raizing and published by Electronic Arts, this offers as much excitement as you can possibly get from Sega's ill-fated Saturn. Soukyugurentai has the same distinctive and flamboyant look of a Japanese comic book or anime lending the game a unique aura which is collectively atmospheric and grandiose. It's a visual delight, running at a smooth, near-constant frame-rate, packed with several wonderous graphical gimmicks including seamless application of mode seven accompanied by a staggering display of pyrotechnics. What makes Soukyugurentai such a masterful game is not its graphics, but the fact that it is dangerously compelling, despite the fact that it is so unbelievably difficult even by shoot em up standards. The game has 9 difficulty levels - a continuum since there is not much difference between each settings. Huge, landscape-eclipsing fighter airplanes bombard you with dozens of bullets while you're hands are already full with dealing with smaller aircraft ruthelessy deploying four to eight missiles at a time. This is the sort of situation that you'll often find yourself in Soukyugurentai. And more often than not, the only way to get out if it is to die. Yet the incentive is still there to carry on, thanks to the brillant responsiveness of the controls and the motivating soundtrack. You won't want to give-up until you have finally lost all of your five credits and even then you'll want to take it on again. Finding routes or patterns is the way out of most dilemmas in games. If it isn't option A or C then its B. If you've tried A and B, then its C. Not B or C? Then it's A. This is rule that virtually all gamers know. If you're stuck at some point in a game, through trial and error, you find a solution. What's refreshing about Soukyugurentai is that you cannot rely on this principle - its an unpredictable shoot-out that has you on the edge of your seat all throughout its half a dozen or so stages. Trial and error works here to some degree, but the rest is all about being vigilant and having good hand co-ordination. With Soukyugurentai the Sega Saturn fires on all cylinders and will give you one of the most pleasant videogaming experiences you'll ever have. scenes plus an extra ship (a yellow one) not seen in the Saturn release. The downside is slowdown is far more apparent - Working Designs apparently had the chance to release PSX Souky but didn't due to this factor. Go for the Saturn one if you can. You can read a dedicated review of the Playstation version at Anime Playstation here. Stage screenshots to follow shortly!